The most trusted guide to publishing poetry! Want to get your poetry published? 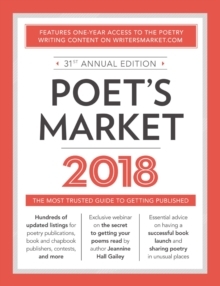 There's no better tool for making it happen than Poet's Market 2018, which features hundreds of publishing opportunities specifically for poets, including listings for book and chapbook publishers, print and online poetry publications, contests, and more. These listings include contact information, submission preferences, insider tips on what specific editors want, and--when offered--payment information. In addition to the completely updated listings, Poet's Market offers brand-new articles devoted to the craft and business of poetry, including how to handle a book launch, delivering poetry in unusual places, starting your own poetry workshop, and more. You will also gain access to: A one-year subscription to the poetry-related information and listings on WritersMarket.comLists of conferences, workshops, organizations, and grantsA free digital download of Writer's Yearbook, featuring the 100 Best Markets: WritersDigest.com/WritersDigest-Yearbook-17Includes exclusive access to the webinar "PR for Poets: The Secret to Getting Your Poems Read" from Jeannine Hall Gailey, author of Field Guide to the End of the World and The Robot Scientist's Daughter.